Ideas about food, books and everything life brings my way. Now – I know pancakes aren’t very earth-shatteringly original, and they don’t use up anything in the freezer (unless you’re my friend Sue – in which case your freezer is full of different kinds of flour), but the kids loved them! After I’d cooked up about half of the batter, I decided I should be “makin’ banana pancakes”. Nothing beats banana pancakes with home-made strawberry jelly! 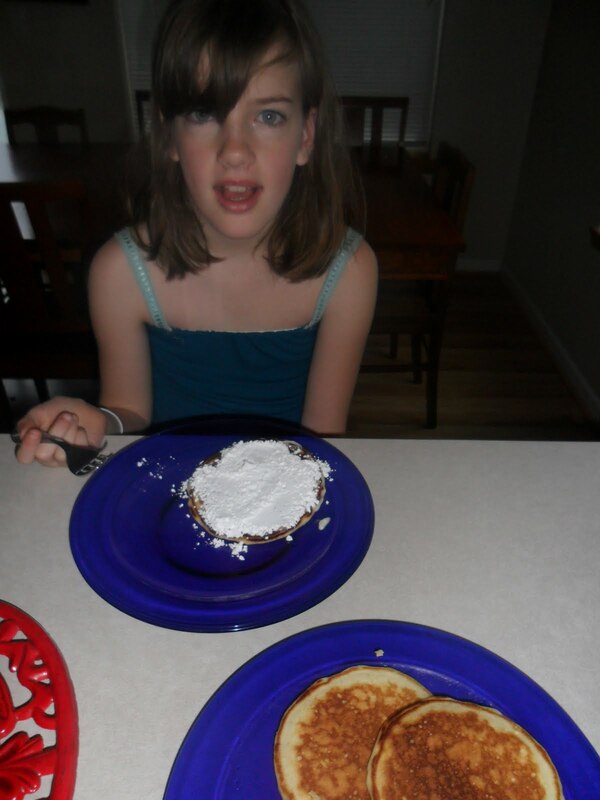 Abby’s idea of “a little” powdered sugar. Sift or whisk the dry ingredients together in a medium mixing bowl to ensure most of the lumps are gone. Whisk in the wet ingredients, making sure to not OVER mix the batter. 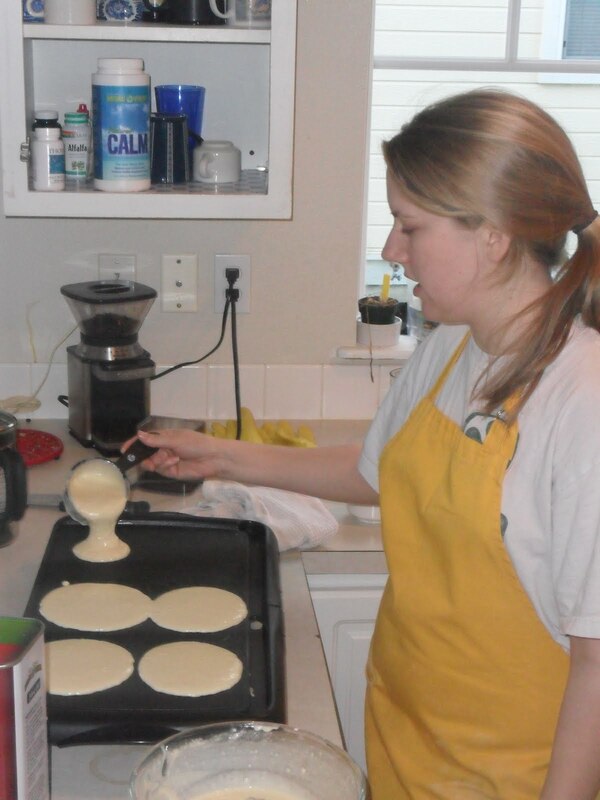 When griddle is nice and hot, use a measuring cup to poor batter onto griddle to make preferred size of pancakes. Flip pancake over with a spatula when the edges are starting to brown and the bubbles that are appearing have started popping and staying open. 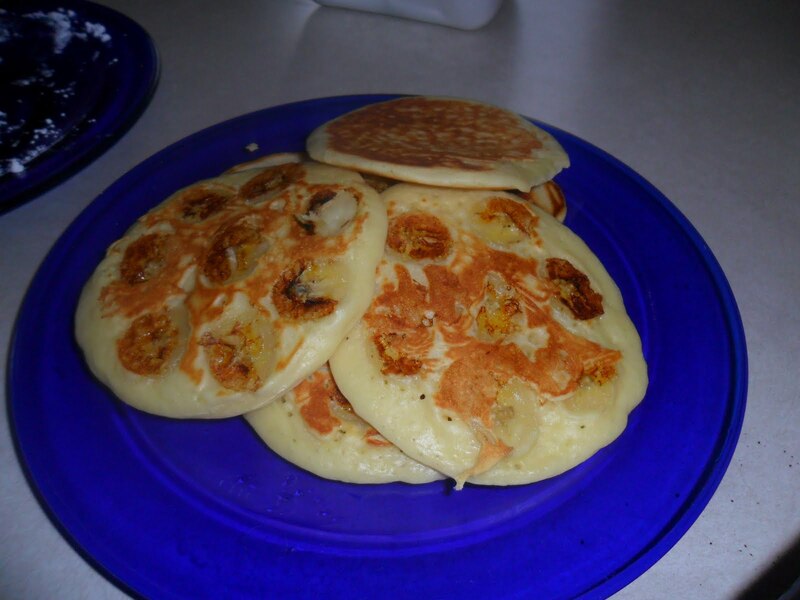 To make banana pancakes – simply thinly slice a banana into coins and lay on the pancake AFTER the batter is poured but BEFORE it is flipped. Eat with plenty of butter and strawberry jelly… Or honey… Or powdered sugar… but ALWAYS plenty of butter!